Trashion Fashion Week – April 4-12, 2019! Sonoma Community Center’s fundraising Trashion Fashion Week was April 4-12, 2019 where we celebrated recycling and reusing our materials for the greater good of our planet. Thank you again Sonoma for all who participated, helped, and supported! Trashion winners and EVERY Junior Participant can pick up their envelopes in the Main Office during regular business hours. GALLERY 212, Sonoma Community Center. During the full Week of Trashion “Barbie: Reclaimed & Reinvented,” will be on exhibit in Gallery 212 at the Sonoma Community Center. The exhibit includes a silent auction of the dozens of cast off Barbies rescued from local thrift stores and recycling plants repurposed and dressed in tiny trash couture by local artists. The dolls will be available for sale as well. The exhibit will remain open through April 12 and will include the Trashion Week “Wrap Up” Party – Friday, April 12 at the Sonoma Community Center where final Barbie bids will be made, Trashion Fashion contestants will exhibit their designs, and winners of the Trashion Fashion Show will be announced. Download Submission Form HERE to participate. THE 9th ANNUAL TRASHION FASHION RUNWAY SHOW! 11:00am, Sonoma Community Center Secret Garden. Sonoma’s own Trashion Fashion contest and show for pets! This free event open to the community will showcase pet-friendly original creations from recycled materials of course! Owners may dress up as well. Winners will be awarded and PetsLifeline will be on hand to offer adoption opportunities. All well-behaved canines and owners are invited to participate in Dogs on the Catwalk – Sonoma’s only Trashion Show for dogs. To participate, register HERE. When you troll thrift shops, yard sales, and Recycletown, there’s nothing so exhilarating as coming across a treasure you know is just right for your garden. Your spouse or friends might say, “What, that’s just an old piece of junk.” You know better. With a little sanding and paint, some glue or nails, you are certain you have scored a unique art piece for your yard. Rust, scratches or chipped paint are fine; they just add character. In her powerpoint presentation, Sandy will show you 100’s of fun and creative items that you can add to your garden, just the way you discovered them or with a little bit of touch-up love. Come early, space is limited. Instructor: Anastatia Chiurco. Turn your crafting or Trashion scraps into a mixed medium collage work of art. Experience firsthand the creative encaustic technique: glued layers of paper and mixed medium on a wood board that is then sealed with a bee’s wax mixture. After the wax has been applied, you will have the opportunity to add items of your choice (i.e. washi tape, keys, metal items, wooden letters, ribbon, or rickrack) to stick to the wax and create a 3D collage. Students will also be given the chance to melt in shapes and paint. Bring your imaginations and willingness to play. Students should bring copies of old pictures, or any item you would like to put in your collage (we can find a way to include most things). If you have old magazines, phone books or sheet music that you are willing to share please bring it. Instructor: The Epicurean Connection. You are invited to enjoy delicious hearty soup, crisp fresh salad, and an adult beverage as you learn directly from The Epicurean Connection about the art of preparing unplanned meals and looking into our community’s food waste. Walk away with new inspiring recipe ideas and ways that we can do our part in the world. Instructor: Lexi Bakkar. Recycling is cool especially when you can wear it! Students will learn how to turn old bike tubes into fun earrings, necklaces and other jewelry. This material is so versatile, easy to work with, and many people mistake it for leather. All materials are provided. Come party like Trashionistas! And don’t miss this event where it all comes together – Final Barbie bids will be made, Trashion Fashion and Dogs on the Catwalk contestants will exhibit and discuss their designs, and winners of the Trashion Fashion Shows will be announced and awarded prizes. Save the Date! Food, drinks, recycled crafts and so much more! 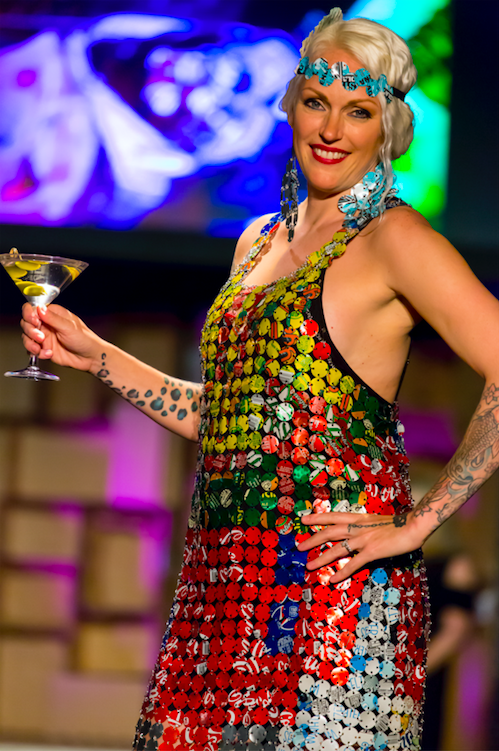 Thank you to our Trashion Fashion Week Sponsors and Partners: Republic of Thrift, Rancho Maria, Master Gardeners, Pet Food Express, Bon Marche, Aaron Avery & Christopher Mahurin, Recology, Cafe La Haye, Friedman’s Hardware, Sonoma Garbage Collectors, John & Phyllis Gurney and The Girl and the Fig. Additional Support from the City of Sonoma and the County of Sonoma Board of Supervisors. Proceeds benefit the Sonoma Community Center’s educational programs. The Muse – A Fantastic Evening!